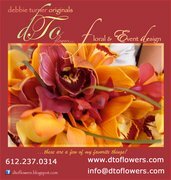 Debbie Turner Originals is an upscale floral and event design company. We have been in business since 1989, and cater to the special needs of each bride and groom and their special day. We work with them to create living works of art with flowers unique to their event. Debbie is extremely nice and knows exactly what she is doing! She has been in the business for a long time and was always working hard to find exactly what I wanted. She really came through on the big day for us too- helping with set up, etc. Highly recommend her services!